When we moved in our house last year we knew we were going to be replacing lots of light fixtures (along with all sorts of other stuff which can be found in the archives of this lovely blog ;). Our first lighting job was going to be the kitchen. It was SO dark. I mean like, "I might cut myself while slicing an onion dark" or "I can't tell if my steak is well done or rare dark". Just pitiful lighting for a kitchen. Speaking of pitiful, the worst light in the kitchen was the bedroom type light fixture right over the island... this drove me totally nuts! Bedroom lights are not kitchen lights, why was this so confusing to the person who picked the light fixtures for my house?? 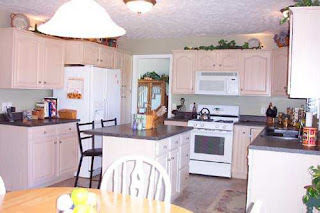 *This "before" pic is from a real estate web site and these were NOT my previous decorations, you can just barely see the cheapo light over the island but you get the idea. Anywho, we really wanted to put in some pendant lights over the island but it was going to cost some big bucks to have an electrician come in and run additional wiring and cut holes in the ceiling to install them. You know me... I don't like to spend big bucks on anything! Wandering around Lowe's one day I came across the pendant light globe section and was drooling over the selection of globes. My kitchen so needed one to take the place of the pitiful bedroom light. I was about to walk away when my little guy threw his sippy cup on the floor, when I bent down to pick it up I noticed on the bottom shelf some "pendant light kits" it was just what we needed! A kit that allows you to hang 2 or 3 pendants from one light outlet in the ceiling. SWEEEET! You even get to pick your own globes!! It was fairly inexpensive, the kit plus the globes was around $65 bucks. If you (or someone you know) can switch out a light fixture your golden. (thankfully, sweet hubs is good at that stuff). How does it work?? Well, instead of having a separate hole with wiring in the ceiling for each pendant, it uses the one that is there and hangs the pendants from a "decorative bar" instead of separate holes. The only trouble we ran into was that the original light fixture wasn't exactly centered over the island and the kit pendant bar is meant to be centered over the existing wiring. We were able to get around this problem by centering the bar where we wanted it and adding an extra black screw to hold it in on the "far" end. No one will ever notice. Plus, I can see while chopping onions and eating steak... inalienable rights of any homeowner! I'm linked to Thrifty Decor Chick Before and After Party! Love it...really made a difference! Much better! You are going to really enjoy that little change. I agree, what a difference! I love pendant lighting and yours turned out looking fabulous! Wow, that's awesome!!! Pendant lighting is so pretty. I think it looks great! I want to put some over our bar, but we don't have any wiring there. Boo! Great pendant lighting!! Wow your kitchen looks like a model home. So clean and neat! I just had a mini remodel in mine but I have serious kitchen envy over your counters and island. That simple change makes it look 10Xs better. Lucky for you your son threw his cup :). Your after photo looks like it could be from a magazine. It came out great! I really like the pendants over the island. Why would anyone ever put a small flush mount light there???? I always wonder if people let the electrician decide or if that is what they wanted!!! That looks wonderful. wow what a difference. I know you're lovin it and rightfully so. you have a beautiful kitchen. Your new light is gorgeous, very chic! I can SEE that black screw!! Beauitful pendant and beautiful kitchen! Thank God for gravity that landed the sippy cup next to your new light! It looks really nice. I love the three lights! I love the new lights! I'm starting on my kitchen next week and am hoping I can get a new light within my budget; I'm going to have to check out Lowe's for sure! Thanks for posting about this, I've been wanting to change some fixtures in my rental for cheap. 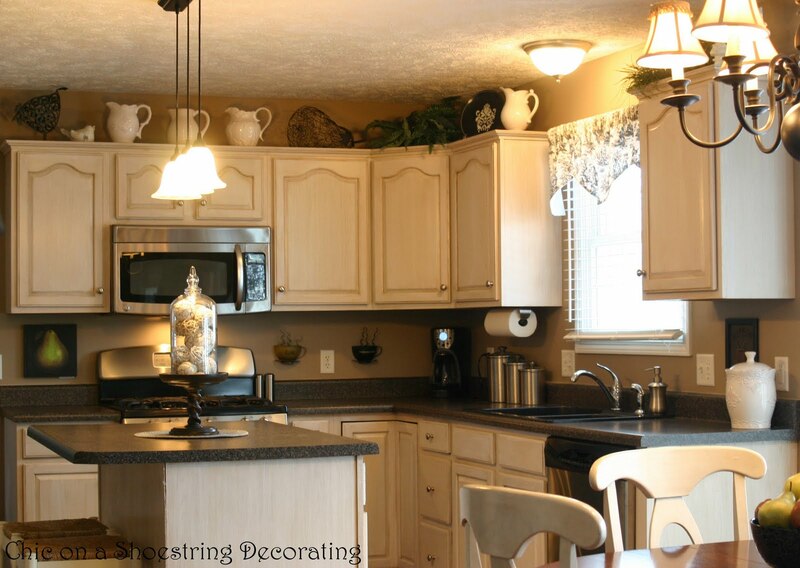 You did such a great job on decorating your kitchen, it's beautiful!! Very pretty! I love pendant lighting! Hello, I luv your blog! How pretty! I am must sign up to follow! It looks so good - what a difference. Welll...I would notice! :):) I'm teasing! It looks great. Just great! Yes, the new one very Chic! Those lights make such a difference. I will have to look for that kit at my Lowes. Thanks for the info. Too clever! So glad the sippy cup landed just there! I think it looks great!